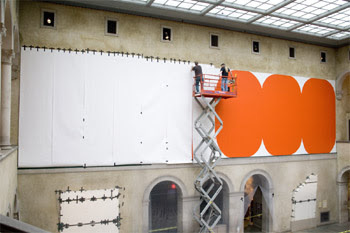 Images above show Charline von Heyl’s installation in progress at the Worcester Art Museum. They will be working throughout the weekend to complete it by November 19th. The original study for the mural. 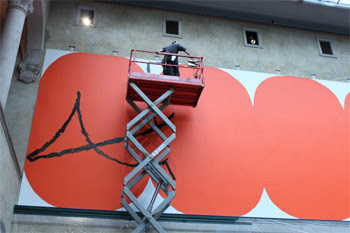 Other artists who have been invited to paint the wall include Arturo Herrara, Sophie Tottie, Annette Lemieux, Denise Marika, Julian Opie, Jim Hodges, Alexander Ross, and the collaborative THINK AGAIN. 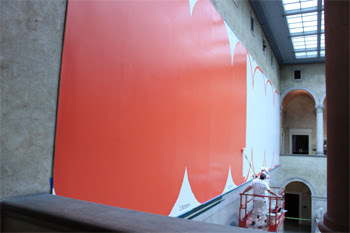 “Wall at WAM: Charline von Heyl,” organized by Susan L. Stoops. Worcester Art Museum, Worcester, MA.Opens November 19 and stays up for quite a while. no exception to this rule. Wow! Credit for your opinions on the blog post Blogger: Two Coats of Paint, they seem to be incredibly handy. Next Next post: Maria Lassnig: Less sensational?